Clove Spice | Has Numerous Uses in the Kitchen With Many Health Benefits! The clove spice (syzygium aromaticum) is one of the most versatile ingredients in the world, which can be used in sweet dishes or savoury and many dishes inbetween. It's an important ingredient in Indian food, Mexican cuisine, and in the making of a baked ham and delicious gingerbread. Originally native to the splendidly named Spice Islands of Indonesia, it's harvested from the dried flower buds of the evergreen myrtaceous tree. Today, this spice is mostly grown and harvested in Indonesia, Pakistan, Sri Lanka and some African countries along the Indian Ocean. 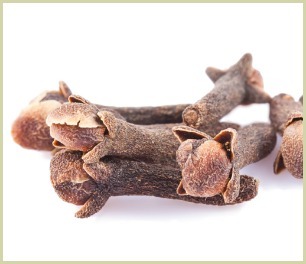 The history of cloves goes back centuries, with references in ancient Chinese texts as early as 400 BC. And it was Arab traders who introduced them to Europe in the days of ancient Rome. But it wasn't until the Middle Ages that they really became popular and were widely used to mask the flavour and smell of badly preserved food. When they first grow on the evergreen clove plant, the flower buds are pale pink, and eventually they turn green, and then bright red, which is when they are ready for harvesting. When they're picked, they are about 2 centimetres long. They are then dried until they turn a rich brown colour, and are very hard in texture. More on the plant. One of the most popular uses for the clove spice is for baked ham or pork, studding the cut of meat by pushing in the pointed end. Ground cloves are used to flavour some very diverse dishes, from the fiery Indian vindaloo to gingerbreads, mulled wines to mild split pea soup and Worcestershire sauce to sweet pumpkin pie and many blends! Read more on their uses. Note: Buy them whole and grind them yourself, as the pre-ground powder can lose its flavour quickly. Ancient Chinese medicine used them to treat stomach and digestive problems, as well as fungal infections. In the middle ages, German doctors used the spice to fight gout. Today, oil of clove can help fight strep throat and pneumonia, and herbalists recommend them to help stomach problems. India’s Ayurvedic practitioners have long used them to ease problems with breathing and digestion. In other cultures, a potent cup of clove tea is often prescribed. Click here for my recipe.